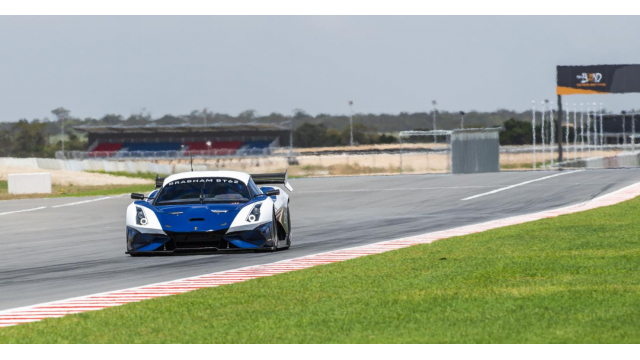 Brabham Automotive has made further history after its unrestricted track car, the BT62, broke the lap record on the International Circuit at The Bend Motorsport Park during routine testing. Download photo Formatos multiple | Que es esto? After conquering Philip Island last year and more recently setting a new unofficial lap record around the iconic Mount Panorama circuit, this completes a triple crown for the Australian high-performance manufacturer. Driven by Luke Youlden, the BT62 recorded a time of 1.41.6 around the 4.95km International Circuit. The lap record was previously held by Supercar driver David Reynolds with a time of 1:47.6978 in an AMG GT3, set during the Australian GT category of the Shannons Nationals in April 2018. That time was subsequently broken by Formula 3 driver Cameron Shields in his 2008 Dallara during the South Australian State Championships with a 1:41.7753 in October 2018. When The Bend Motorsport Park was announced as the official Australian testing partner for Brabham Automotive, those that saw what the incredible BT62 was capable of predicted that it wouldn’t be long before the lap record fell again. Brabham Automotive has been testing at The Bend Motorsport Park since May 2018 and will continue to test the BT62 as it ramps up its racing programme as part of its recently announced Road to Le Mans. Fearlessly determined and continually pioneering limits, Brabham Automotive is borne of a pedigree that has stood the test of time – a racing dynasty like no other. The company has its US, European and Middle Eastern office in the UK, whilst its Australasian and Asian office is based in Adelaide, South Australia, where the BT62 is also manufactured. Only seventy BT62s will be manufactured, making Brabham Automotive’s project very exclusive in nature. The Brabham story officially began in 1948 when Sir Jack Brabham made his Australian competition debut. Sir Jack Brabham went on to become a triple world champion and in 1966 became the first, and still the only, man to win a Formula One world championship driving a car of his own construction, a feat which is unlikely to be ever matched. Now 70 years on, Brabham remains one of the most iconic motorsport marques with a lineage of champion racers, engineers and innovators. Spearheaded by Sir Jack Brabham’s son David Brabham, a multiple Le Mans winner, Brabham Automotive continues that rich heritage, once again designing and manufacturing cars which defy convention. Weighing only 972kg, the Brabham BT62 has a 5.4l naturally aspirated engine and generates 1200kg of downforce. Despite only building its first car in 1961, by the mid-1960s Brabham became the largest manufacturer of single-seat racing cars in the world, and by 1970 had built over 500 cars. Renowned for its customer service, Brabham had the reputation of providing customers with cars of a standard equal to those used by the works team and provided a high degree of support to its customers—including Sir Jack Brabham helping customers set up their cars. This continues with Brabham Automotive. O ingresar con su dirección de correo electrónico - Respetamos su privacidad y nunca publicar en su perfil social a menos que nos lo pida. Para obtener más información, por favor, lea nuestros términos y condiciones y la política de privacidad. Esta información se registra para su seguridad.